On November 18th, my friend Joe had attended the funeral services for Dan Hartman's father. Joe had shared with me in an email how beautiful the service was and how the Pastor shared that Dan Sr., received Christ, bridging the gap between ourselves and God. At the conclusion of the Pastor's eulogy, he asked if anyone who wanted to receive Christ to raise their hands. There were at least 12 people at the funeral whom had acknowledged that they did want to accept Christ into their lives as Lord and Savior. Joe saw Dan Jr., at church the day after and said to him how touched he was by the funeral service and he praised the pastor for inviting others to accept God's gift of forgiveness and salvation found only in Christ. As excited as Dan Jr., was about his father coming to know Christ before his death, he was even more excited to learn that those whom had made the decision to accept Christ at the funeral, were friends of his father. I cannot imagine the joy Dan Sr., experienced when he entered the gates of Heaven and met the Lord Jesus as He was waiting for him. I cannot even imagine his gratefulness to his son for faithfully holding onto the faith which he has had and often shared with others, as the Bible calls for us to do. Dan sowed the Gospel into his father's life and that reaped a harvest which Dan Sr., had no idea would amount to anything. Whenever I go to California to visit my family, I really do look forward to the trip. I look forward to spending time with my mother, my uncles, aunts, cousins and my grandparents. On my recent visit, my mother met me at the airport to pick me up and I was surprised to know that my grandmother had insisted on coming along to see me at the airport. I love my grandmother dearly and it touched my heart so much that she wanted to see me when I arrived. I teared up a bit knowing she was waiting to see me with my mother. I felt much the same way when my grandfather suprised me and came to Parris Island to see me graduate from Marine Corps recruit training. Think about whenever you travel. There is always someone waiting at one end to see you and they are waiting with expectation and joy for your arrival. I can only imagine the excitement Jesus has when He is expecting the arrival of those who have committed their lives to Him. Thank you Mom and Grandma for being like Jesus. I love you. Cheers Grandma!! Jesus said that He desires for each person to be with Him where He is (John 17:24). If you are unsure that you would even go to Heaven when you die, I would encourage you to make the same decision as Dan Hartman's friends did. Take these steps toward Him, to have Peace with God. 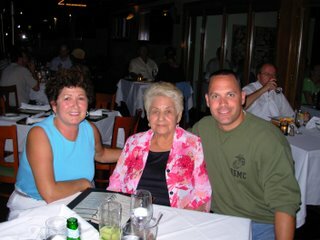 Love the picture of your grandmother, mom and you, what a great story too, touched my heart. God bless your grandmom for loving you, you're blessed to have a loving family. Praise the Lord for your passion and zeal! Continue to impact the Kingdom of God by spreading the message of Salvation!! Very nice blog Kurt. You hit the nail right on the head. What a joy it's going to be when we see Jesus waiting for us in Heaven. Your grandmother looks like a pip!!!!!! God Bless Kurt and I continue to pray for you each day. Dude! I read the rest of the message. Beautiful! I hope all is well with you. Church and hospice work is keeping me very busy. It's about time for some vacation time. I'll try to get in touch before Christmas. Cheri and I were talking about our week in Asheville just this week. We would love to go back. Talk soon! God bless! Your blog is beautiful - it was great to see your mom - I haven't seen her in about 25 or so years. Love Ya!!! !